Domenico and I met at what had become our usual meeting spot at the base of Ponte Viva Rini, a rather central bridge of Murano. Our first visit of this day was with Cesare Toffolo for a quick demo and an interview (watch on YouTube). We enter Cesare’s beautiful gallery space. Cesare has been the most important mentor of my 19-year glass career. His dedication to quality, respect for history, and perseverance towards innovation are great inspirations for me. 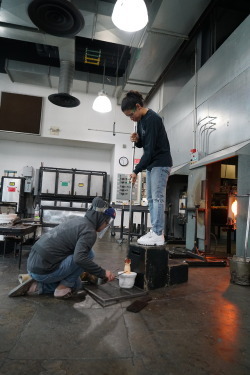 Not only is he an incredible glassmaker, but he is also a wonderful international ambassador for flameworking and the Muranese glass traditions. I have been fortunate enough to not only be a student in one of his classes, but I have also worked as Cesare’s teaching assistant for several classes. I still have the first goblet I made as a student in his class in 1999, and it continues to remind me of how far I’ve come and the hard work it takes to grow even further. These opportunities have afforded me the time and access to hear some of his personal stories. Some of this information has already been recorded, but I was anxious to delve a bit deeper with the camera rolling. Cesare’s father, Florino, was a highly-respected maestro at both the furnace and torch. During World War II, the Nazi’s took Florino as a prisoner and used him for his glassmaking skills. He was forced to make laboratory apparatus for the Nazi war machine’s scientists. When he was freed at the end of the war, he came home with even greater conviction to continue his glasswork. 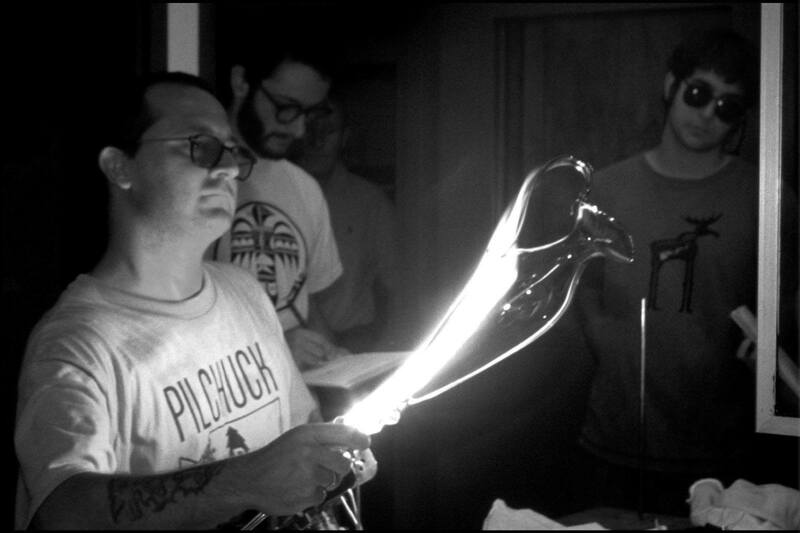 In his early teens, Cesare realized that standard academia was not the path for him, and his father began teaching him the fundamentals of flameworking. The lessons were very exacting and required that he develop great control over the material each step of the way before the next lesson would be introduced. This all helped Cesare to develop the incredibly high standards he has for his own work, and it influences the lessons he continues to share with his sons Elia and Manuel as they grow as glassmakers. A beautiful example of how Cesare combines his technical skills with his personal artistic voice. 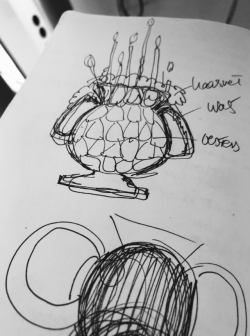 Cesare takes traditional Venetian stemware to a new level. In these goblets, he has trapped air bubbles to create patterns in the cup and foot. 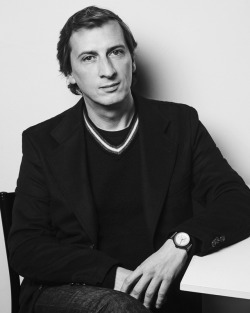 Cesare was good enough to share a great deal of his history and insights with us over the course of about a 45-minute interview. Once the interview has been properly edited and sub-titled, it will be kept in our archives at the Rakow Library for perpetuity. From Cesare’s studio, we made our way a few doors down for a quick tour of the private collection at the Barovier e Toso factory. Unfortunately, we did not have much time to spend at Barovier e Toso as we had appointments lined up for interviews the rest of the day with cold workers Pietro and Ricardo Ferro, tool maker Roberto Dona, and furnace glass maestro Davide Salvadore. Those of you who have been following this blog series may appreciate hearing about two exhibitions that open in Venice in the beginning of May and June. Several of the artists who are being represented in this series of posts will be showing work in one or both of these shows. Here is a nice article about the exhibition “In Glass We Trust” http://www.muranonet.com/unfold-venice/in-glass-we-trust/. 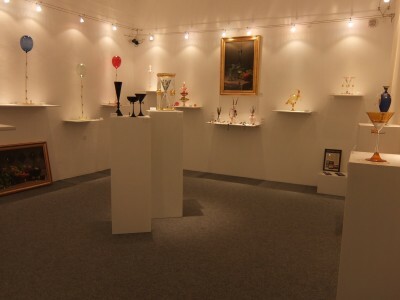 Here is a link to information about “Exhibit Murano” http://inmurano.com/en/expo-murano-en.html. Eric Goldschmidt is the Properties of Glass Programs Supervisor at The Corning Museum of Glass. He has been working with flameworked glass since 1996, when his roommate introduced him to the torch. Since then, he has studied with and assisted many of the world’s most talented glass artists. These experiences have given him a vast array of techniques from which to draw. He combines this wealth of knowledge with his own interests in the subtle energies of the natural world, delicate forms, and intricate color application to create original new works. Love the Murano glass tradition and the beautiful artworks made by the glass artisans. Thanks Eric for your beautiful article and also for keeping alive the beautiful art of Murano glass.